Pollution is a chief factor for data centres, due to the quantity they create they are required by law to use special equipment, but they occasionally use as much electricity as a small town because they use so much equipment. Data centres have a set of minimum requirements in regards to what their infrastructure is, they’ve been provided a topology which can be pertinent to any dimension data centre, there are also guidelines for data centres that are part of the telecommunications networks, such as environmental requirements for the equipment that they use. In case a data centres systems are out of date they may use what is referred to as a transformation initiative to upgrade and better their present systems, the initiative is split into four endeavours called; safety, standardisation, virtualisation and automation. Virtualisation is where devices that are used in the data centre are united for example one device could run multiple virtual servers, this equates to less space being utilised, less operational expenses and it reduces energy usage, virtualisation additionally allows for data centres to supply virtual desktops to consumers. Because of the fact that many data centres have problems with a deficiency of skilled IT staff, automation makes working the data centre more efficient, operations such as settings, patching, provisioning and release management are automated, automating operations may also reduce the expenses the data centre has to face. Securing a data centre is reached both physically by implementing armed guards and utilising CCTV cameras, it can also be preserved by security of the personal computers, this is of equal, or even greater relevance for a data centre. : Helium, is about seven 7x less dense than air. This produces less turbulence and resistance, this allows for enormous advancements to nearly every part of a hard disk drive’s operation. 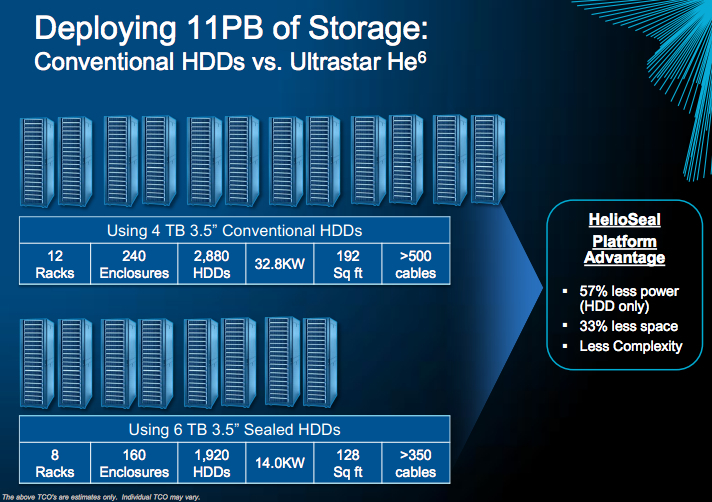 With a helium environment, you may spin the platters quicker, have more platters, have denser tracks on the platters, and consume less power.For now, it seems like Western Digital/HGST has opted to enhance the max number of platters (from five to seven) and reduce power consumption (23% lower idle power, 49% lower watts-per-terabyte). There’s no word on spindle speed, but it’s probably 7,200 RPM just like the standard, air filled Ultrastar drives. The Ultrastar He6, in case you were interested, is an enterprise-class hard drive — there’s no word on pricing, but the air-filled Ultrastar 7K4000 is $315 from Amazon, so the He6 won’t be affordable just yet. The 6TB Ultrastar He6 is on sale from today. There’s no word on pricing, and it isn’t apparent if this will be a thing that you can buy from most hard dive suppliers. With helium costs are on the rise (and US authorities only narrowly preventing the closure of the world’s only strategic reserve), we might anticipate the He6 and future helium- filled drives to be high-priced, niche products. If you’re seeking to assemble an awesome submerged water-cooling rig, you need masses of storage capacity, and money’s no problem, then today’s your lucky day. John McAfee has apparently decided on his next project, an Android app security interrogator called “Cognizant”. The Android app is a safety tool of types, inasmuch as it apparently conducts a census of all of the apps in your Android device and reports about what they have been permitted to do on it. McAfee believes this functionality is an excellent idea because many apps ask for authorization to command just about all of a Android device’s functions, like the capability to study place data, make calls and shoot pictures. McAfee’s logic supposedly runs, if consumers know about this behavior, they’re going to either delete piquing apps or think twice before installing them. Cognizant will seemingly appear on March 1st, with McAfee taking part in a web-based chat on February 14th to provide more depth on his new enterprise.